Giving you the star treatment. Always. Hollywood Plaza has all your everyday needs. With Target, Coles, Woolworths, approximately 65 specialty shops and a delicious food court, it’s the place to get everything from the friendly faces you’ve grown to know. Shop locally at Hollywood Plaza, with over 65 specialty retailers, you’ll find quality fresh food, a variety of specialty shops and a range of essential services all under one roof. And with Coles, Target and Woolworths you can be guaranteed that Hollywood Plaza has everything you need. Our location and easily navigated car park, complimentary wheelchair hire and three strategically located parent’s rooms near Coles, Fernwood and the food court make us a centre of convenience. Hollywood Plaza is located some 18kms north of the Adelaide CBD on the corner of Spains Road and Winzor Street, Salisbury Downs. Adjacent to the main centre is Super Cheap Auto, Anytime Fitness, the Hollywood Car Wash, a Salvos Store, Cheap As Chips and Woolworths Plus Petrol. Public transport is made easy with bus stops situated on Winzor Street and on Spains Road. For more information on timetables, please telephone Adelaide Metro direct on Phone: 1300 311 108. 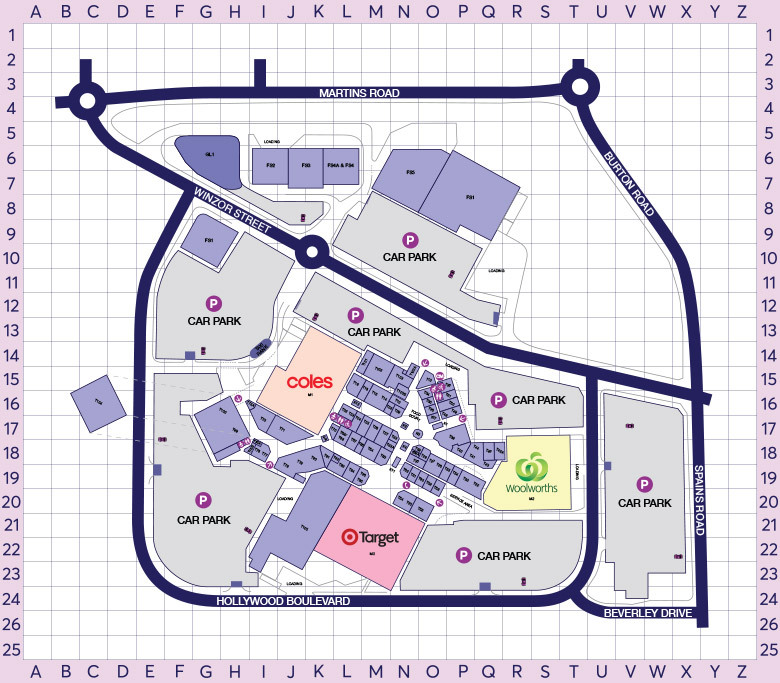 A sheltered taxi rank is conveniently located near the southern end of the centre near The Reject Shop. Hollywood Plaza has a number of Casual Mall Leasing sites available ranging in prices according to location and retail season. Lost and Found Property enquiries can be made with Centre Management on (08) 8250 1599. Hollywood Plaza does not permit within the centre smoking, bicycles, skateboards, scooters, roller blades or roller skates, animals (except guide dogs), distribution of handbills or other advertising material, soliciting of unauthorised products or business, unauthorised selling of raffle tickets and consumption of alcohol outside licensed premises. Payphones are conveniently located near Coles and Target. Telstra Payphone is located near the taxi rank at the south of the centre near The Reject Shop. ATMs from the following banking providers are conveniently located throughout the centre – ANZ Bank, Redi, Bendigo Bank, Commonwealth Bank, Westpac, and People’s Choice. Amenities are conveniently located near the Food Court, Coles and Fernwood, including access for the mobility impaired. Parent’s rooms are available in all three amenities locations. Parent’s Rooms are well equipped with changing tables and bottle warming facilities. Parent’s Rooms are equipped with changing tables and bottle warming facilities. They are located near Coles, Fernwood near the amenities and the corridor behind the food court. Wheelchair hire is available from Centre Management free of charge, with approved identification. Hollywood Plaza has a designated site available for not-for-profit organisations. For more information please contact Tiarne Stephens on 08 8250 1599 or via email tstephens@retprogroup.com.au.